A little larger set to suit your needs! 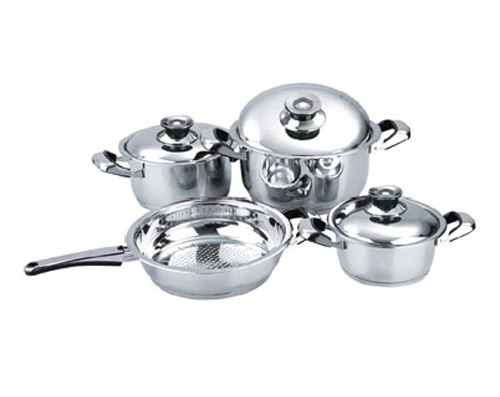 The cookware in this Mert 7-Piece Stainless Steel Cookware Set will work for you if you want only a skillet and several pots and pans with thermometer control lids. Stainless steel with aluminum encased stainless pan bottoms. Construction material Is high quality stainless steel which is desirable for its dependability and good looks. Aluminum core sandwich in the pan bottoms Helps heat transfer evenly and quickly. Thermometer knob lids Help control cooking temperatures. Tight fitting lids Help hold in moisture and nutrients.